Kirk: That was a good fight. Pike: Now, there’s your problem right there. The last time we caught up with the crew of the Starship Enterprise, a new audience was being introduced to some familiar characters who all had fresh faces. J.J. Abrams’ first attempt to boldly go where in fact many had been before, genuinely felt like maybe no one had actually gone there before. The 2009 STAR TREK was an incredible success; Abrams deftly reinvigorated a franchise that many thought was completely played out. He brought in a brand new audience without entirely alienating the original fanbase, which is all the more impressive when you consider how much he changed some of the long established lore of the series. In the follow-up, STAR TREK INTO DARKNESS, Abrams picks up where he left off and shows us that many of these young Star Fleet academy fledglings still have a thing or two to learn despite their success. The same can be said for Abrams himself. 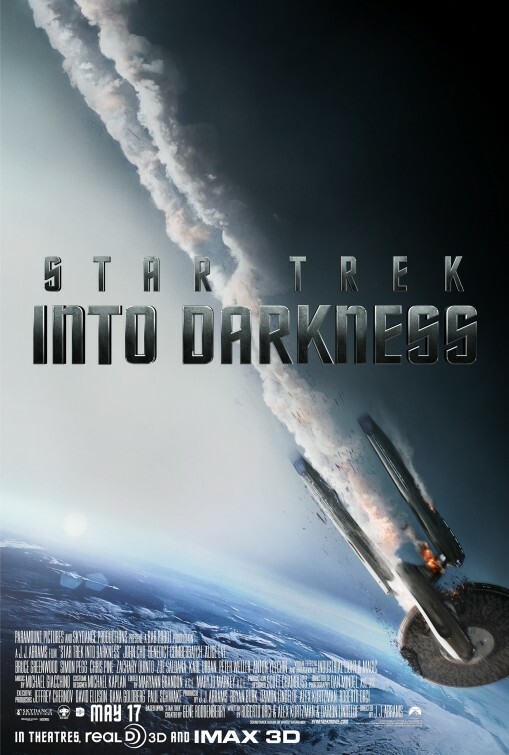 Captain James Kirk (Chris Pine) has just inherited the Enterprise after a rapid rise through the ranks of Star Fleet. His expedited journey to the captain’s chair may now prove to be premature as we catch up with him, and his crew, breaking as many regulations as he can, all for the pursuit of what he personally believes to be what is right for everyone. Meanwhile, his commanding officer, and complicated best friend, Mr. Spock (Zachary Quinto), is facing the fact that though he may try to avoid emotion in most circumstances, he cannot control how others feel about him at the same time. Both must learn that their egos must be put aside from time to time to see what is going on around them and how it affects the people in their lives and, after they are both very briefly demoted and reassigned, they find themselves fighting alongside each other once again. This time, they will need to work hand in hand if they are ever going to defeat their new foe, the infamous Khan (Benedict Cumberbatch). 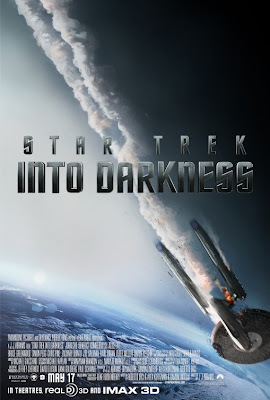 Original screenwriters, Roberto Orci and Alex Kurtzman, brought on frequent Abrams collaborator, Damon Lindelof (PROMETHEUS), to help bring STAR TREK INTO DARKNESS to a whole other level, with mixed results. On the one hand, as Kirk and Spock become more familiar with Khan and his plan, it becomes more and more difficult for them to discern the truth in their mission. Perhaps it is my lack of familiarity with the Trekkie history or perhaps it is Cumberbatch’s incredible ability to disorient the viewer with his nearly impenetrable stoicism, but I was riveted throughout the film while trying to decipher just who to trust. That being said, Abrams also allows the film to make the most of some of its more manipulative moments, sometimes so much so that it almost takes away from the overall credibility of the project with obvious music cues and blatant foreshadowing. The missteps are minor but the crew best not get too comfortable in future voyages. I wouldn’t want the final frontier to get any more mainstream then this. How many sheep would you give Star Trek into Darkness? To be honest I wish I had zero knowledge of Trekie lore. Then maybe the script would not have seen so lame. Why, with the whole universe to explore would you rehash a plot from a superior film from 1982? I actually went and watched Wrath of Khan after seeing this. The similarities are numerous and I can see how you might find it lame, as it does borrow quite a bit from it. I feel as though they are trying to honour while not alienating anyone though. I could be wrong but that’s what I took away from it.